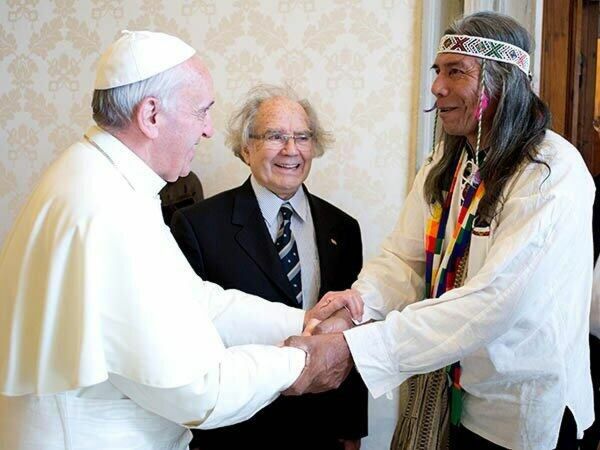 Pope Francis meets with leaders of indigenous communities (Video)For the first time in his pontificate, Pope Francis met with leaders of Argentina's Qom indigenous community. But as Cardinal, he had already met with them at least three times. The group, which included Nobel Prize Winner, Adolfo Perez Esquivel, met with the Pope for about 40 minutes, to discuss human right violations faced by indigenous communities in Argentina and other Latin American countries. It's something they talked more in depth, during a press conference. Comment: For more on the Catholic Church, see Indians Ask Francis to Revoke Papal Bull and Kateri = Symbol of Colonization.